How do you solve a problem like Brandon Inge? Inge is the longest-serving Tiger: He began his career on Opening Day 2001 and is the last remaining member was part of the 2003 team that had 119 losses — that’s one game away from tying the 1962 Mets for utter despair. He was a catcher then, but was bumped the next season to play third base, and some outfield, to make room for Pudge Rodriguez. He was in the World Series with the Tigers by 2006. Last month, Inge learned that he lost his third-base job with the rearranging that began when Prince Fielder rode his heroic stallion into Detroit. Inge gave second base a go, sharing the spot with Ryan Raburn and Ramon Santiago; as a natural fielder, he actually looked like he could make it work, but here’s the thing: Inge is a terrible hitter. This year he’s batting .100 in 20 at-bats. Sure, he has the occasional streak just to keep the fans on the edge of their seats. Or in their seats, rather. After being sent back to the minors last summer, he roared back, hitting a home run in the first at-bat of his return. In September, he averaged .324. His walk-off home run in the playoffs against the Rangers warmed the heart of every lover of underdogs. But the day-to-day story, as Michael Rosenberg puts it, still went like this: Since the start of the 2011 season, Inge has hit .190, with a .255 on-base percentage and .284 slugging percentage. How awful is that? Well, last season batters went .192/.242/.313 against Justin Verlander. Inge turned every pitcher in the major leagues into Justin Verlander. If Inge wasn’t consistently on fire, why were the fans? My theory is simply that Inge appealed to a certain demographic of working-class people who saw him as “their guy” in a deeply personal way. It’s not unusual for that identification to happen in baseball, but given that Inge’s career unfolded just as the auto industry teetered and Detroit hooked into a narrative of its own grit and perseverance (see: Chrysler ads for another sport entirely), all of Inge’s hard knocks, disappointments, and lost opportunities, his being bumped from position to position, his touches of glory, persistent loyalty, hard work in the place of show-stopping talent — well, that amplified how personally a lot of fans were taking Inge. The sheer fact that Inge kept showing up, that he’s lasted this long in one city despite the astonishing odds, adds to the drama. The metaphor kept inflating. “My heart will always be in Detroit, 100 percent, forever,” Inge said Thursday. 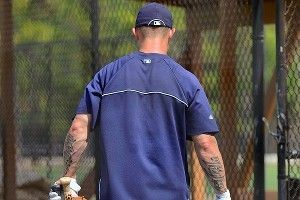 Inge will get the remainder of his $5.5 million contract for this season, plus a $500,000 buyout for his 2013 option. He should be a free agent by Sunday. And he remained a class act about his weird legacy.